Repair and rewinding of electric motors AC and DC high and low tension. 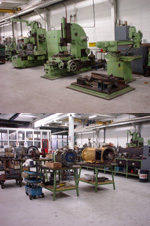 Repair and rewinding of explosionproof electric motors with certificate, approved by the major classification societies. Repair and rewinding of AC and DC generators. Repair of winches, pumps, cargo gear, deck machinery and compressors. Machine work: turning, boring, milling, metal spraying. All kinds of welding work.